What if God had a plan for your life since the very beginning of faith itself? Chris Hodges explores four promises that God first made to his people in the Old Testament, and are still at the core of his plans for you today: your rescue, your deliverance, living out his plan, and being an effective part of his family. 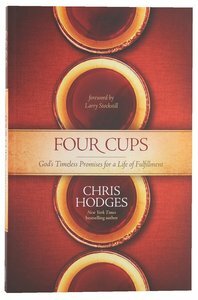 About "The Four Cups of Promise: The Journey to Fulfillment God Planned For You"
Customer Reviews For "The Four Cups of Promise: The Journey to Fulfillment God Planned For You"
There are many types of prayer, but Greg shows us that 'extreme prayer' can be the  most powerful. extreme prayer is a type of intercessory pray, its a pray that many at once are praying, and it is God blessed. Greg shows us a new approach to daily prayer, not one to take over our daily prayer life but one to add to it. and by adding it to our prayer lives, we are doing the will of God.